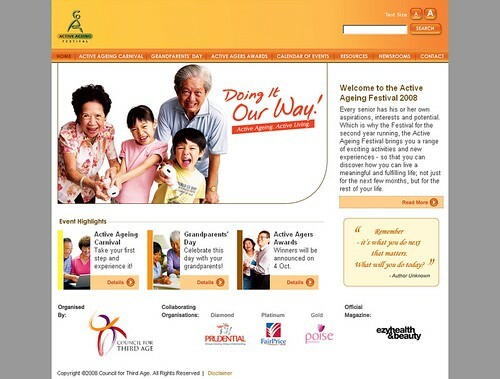 Maintained the Active Ageing Festival (AAF) corporate microsite. Implementation of Content Management System (CMS) to Events & Calendar sections. Previously, for all changes to the Website, the corporate communication department have to submit a request form to the IT department before any changes could be. This resulted in unnecessary delay in content publishing and additional work for both the Corporate Communication as well as the IT Department. With the CMS implementation, Events could be easily managed and sync with Calendar on the fly. This entry was posted on Thursday, August 7th, 2008 at 1:52 pm and is filed under 2008, Web. You can follow any responses to this entry through the RSS 2.0 feed. You can leave a response, or trackback from your own site.